Meeting: Hospital Medicine 2013, May 16-19, National Harbor, Md. 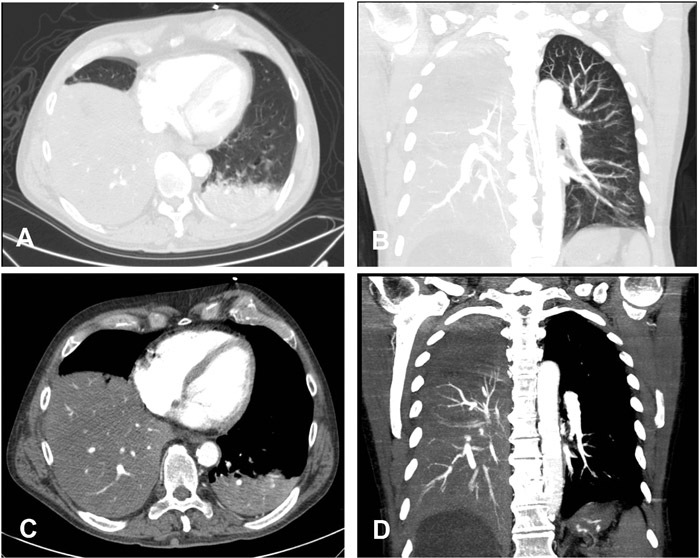 A 55‐year‐old man with history of alcohol abuse, presented with 2 days history of shortness of breath, cough, fever, chills, and confusion. He was unconscious on admission and was intubated and placed on mechanical ventilation. On examination, he was unresponsive with vitals signs significant for sinus tachycardia and hypotension. He had decreased right‐sided air entry with diffuse crackles. The rest of examination was unremarkable. His Initial workup revealed WBC 0.8 × 109/L, hemoglobin 8.1 g/L, platelets 109,000, and creatinine of 3.5 mg/dL The chest x‐ray showed right lower lobe consolidation. Computed tomography (CT) of the chest confirmed the findings of right lower lobe consolidation without pleural effusion. Broad‐spectrum antibiotics and vasopressors were started. Bronchial secretions culture grew streptococcus pneumonia. Given the radiographic and microbacterial findings with the history of alcohol abuse and leukopenia, the diagnosis of alcoholism, leukopenia, and pneumococcal sepsis (ALPS) syndrome was made. Despite all the essential interventions he received, his condition remained critical, and he died a few days later. Alcohol abuse has been well recognized as a significant risk factor for serious pulmonary infections, bacteremia, and shock from typical pathogens, most notably Streptococcus pneumoniae. In addition, alcohol abuse independently increases the risk of adult respiratory distress syndrome (ARDS) two‐ to fourfold. The mechanism by which alcohol abuse increases the risk of pneumonia is multifactorial and includes; increased risk of aspiration, decreased clearance of bacterial pathogens from the upper airway and impaired phagocytosis by alveolar macrophages and neutrophils. Importantly, the mortality among alcoholic patients hospitalized for community‐acquired pneumonia (CAP) may reach up to 65%, which is much higher than the predicted death rate for hospitalized CAP patients (approximately 20%). Leukopenia with WBC of less than 4000 cells/mm3 of blood is another aspect of fatal association between alcohol abuse and pneumonia. This has been remarkably notable pneumococcal pneumonia and can lead to a clinical entity that has been termed alcoholic leukopenic pneumococcal sepsis (ALPS) syndrome, in which mortality rate may reach up to 83.3%. Direct admission to the hospital usually is indicated, and transfer to an intensive care unit (ICU) is mandated for any patient in septic shock with a requirement for vasopressors or with acute respiratory failure requiring intubation and mechanical ventilation. Antibiotic therapy is the mainstay of treatment of pneumonia in alcoholics. Alcoholism, leukopenia, and pneumococcal sepsis (ALPS) syndrome is an uncommon but devastating illness in alcoholic patients. This case emphasizes the importance of early detection and treatment of this condition. Despite aggressive therapy, the mortality rate remains high. Computed tomography (CT)–angiography of the chest shows right lower lobe consolidation with no pleural effusion on both lung window (A: transverse cut; B: coronal cuts) and mediastinal window (C: transverse cut; and C: coronal cuts). Alraies M, Shaheen K, Baibars M, Alrayies A. Alcohol‐Induced Leukopenia, New Myth for an Old Disease. Abstract published at Hospital Medicine 2013, May 16-19, National Harbor, Md. Abstract 344. Journal of Hospital Medicine. 2013; 8 (suppl 2). https://www.shmabstracts.com/abstract/alcoholinduced-leukopenia-new-myth-for-an-old-disease/. Accessed April 22, 2019. « Back to Hospital Medicine 2013, May 16-19, National Harbor, Md.